Many of these people seem to think that Washington, D.C. might be a state (51) rather than a separate district, while others may assume one of the territories is a state such as Puerto Rico. Sometimes both of these are believed, equalling the 52 states. 51 seems correct to me. I’m not sure why or where I started to believe this, or even if I did at all. Perhaps the article itself changed my memory based on lack of knowledge. It seems to me that I have a fuzzy memory of 51, but perhaps because of some of the reasons I explain in the possible explanations. The 51st state is a common phrase used in politics that is applied to external territories as well as parts of existing states which would be admitted as separate states. 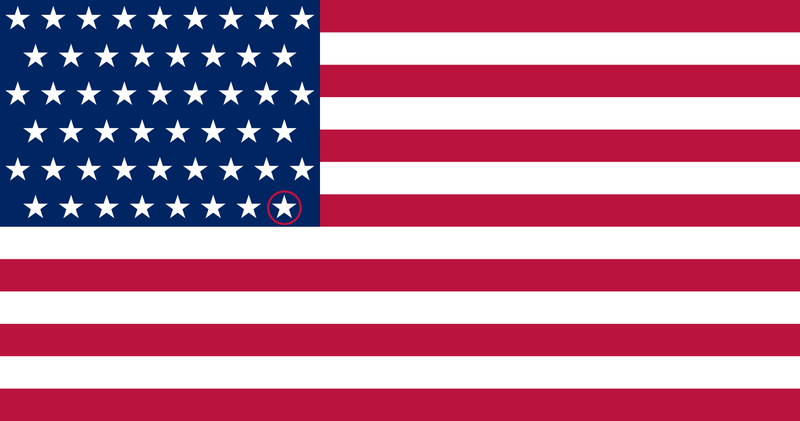 These include the unincorporated territories as well as Washington D.C. There’s even a version of the flag showing a 51st star. If you perform Google searches of things such as “Puerto Rico 51st state” or “Washington D.C. 51st state” you will get tons of news article talking about a potential inclusion of those two examples as the 51st state. 50 appears to be a more strict, rounded number. It almost seems to be too perfect for something so complex as the number of states. Our brains automatically thinks that this nice round number simply cannot be correct, so we go to the next logical step of 51. For example, would you believe there is 200 different countries in the world? Or would it seem more correct if there was 201, or 202, or maybe even 203? As of writing there is actually 196 countries in the world, this was just an example of a possible effect happening. Alaska and Hawaii, two official states are disconnected from the main American landmass. This factoid may be a source of the confusion in assuming that the disconnected states are the two extra instead of included in the 50. There is 52 cards in a deck of cards. This fact may have been learned while growing up or studying, perhaps around the same time you learned that there is 50 states. Perhaps these memories are getting reversed or replacing one another. Officially there are 50 states, but there are jokes on how Texas will secede again and become its own country. Those are only jokes. There’s too much oil to for us to leave without some resistance from the rest of the US. Hawaii didn’t want to be a state either. Look it up. Only 50 states are there in USA officially. Don’t forget Washington, DC (Washington, District of Columbia). Washington, DC is USA OFFICIALLY. Don’t confused with the state: Washington, It supposed to be 51 states: Washington DC. It seems not happened for Washington, DC to become 51st state. While Washington, DC, is an official US city, it is NOT in, nor is itself a state. This was done intentionally by the Founders, so that no state would have legal jurisdiction over the Federal District, and by extension, the Federal Government. It also was not a “city” until 1973, as it did not have a city government. It was overseen by “The Committee of the Whole”, a “committee” of the entire House of Representatives, which ruled as a massive city council for Washington, DC. This, as would be expected, proved to be unwieldy, and thus “home rule” was granted, and the DC City Council/Mayor was formed to take the place of the then present form of government. Long story short – Washington, DC, was not and never has been intended to be a state. Yes, there are efforts to make it one, but that was not the intent. The wolf is cunning with ulterior motives. laying in wait pretending to be a friend, gaining the confidence and being excepted as belonging. The wolf does not belong with the sheep. The sheep except the wolf. Game over man. game over. It was once written, but what was once written has now been written again. The conditioning to except evil as good and good as evil is being done as I speak. The ones that try to tell you your memory is wrong are the wolves. This isn’t cognitive dissonance man! this is a battle for your soul. My input on this is that I do clearly remember 52 as do many other people: however, this may be a mistaken memory since if I was really from a different timeline or universe or what have you, I would also remember the names of those other states and how the geographical maps would look wrong to my eyes, and they don’t. I don’t recall the names “New Brunswick” or “New Scotia” like one writer suggested, nor do I remember any state shapes or the general US shape being different on a map. I memorized all the state names as part of a memory technique book, but there are no traces of any other state names in my mind. I DO remember the time when thought to myself: “50 States? That sounds wrong and just too simple”. But I don’t remember: “Hey, what’s changed about the map!” Or “What happended to such and such a place?” Get my point? We would expect these corollary experiences to happen if this was some sort of true Mandela effect. We would also remember something about what happened in those states, or what they were known for like food, flowers, music, cities, etc. And why do some people remember 51 States and some 52? I am a very critical thinker, professionally trained Philospher, and believe there are many different kwaaazy truths being hid from the American people, e.g. Flat Earth, Hitler survived WWII, the fact that we didn’t go to the moon, ZOG, Atlantis, etc. But I spent a long time on each one of these and ended up changing my thinking from my previous traditional/establishment positions based on good, honest research and lots of uncomfortable facts. They are theories no doubt, but so are most of our beliefs–even if we claim to be ‘rational’ and ‘evidence-based’ thinkers. The world we know through sensory experience is very limited and we all rely on assumptions, inference, the opinions of trusted experts, faith, etc, for most of our worldview. This is basic epistemology. So trying to debunk possible other universes because ‘you can’t show me’ is really not clear thinking either. The new science on this stuff is scary. But the Mandela Effect–however initially compelling–just isn’t cutting it for me so far. Convince me otherwise and I will change my mind. I specifically remember that there are 52 states in the USA because I took a test and I remember the teacher kept telling us don’t forget to count Alaska and Hawaii which made it 52 states. Everyone else that keeps saying that it is 50 is mistaken and our history is being rewritten to change our memories. I used to think that, that was just some made up information trolling the internet but I am confident in my memory and no one can convince me that there are 50 states. Beware because your memory is being tampered with! Yes, I agree- I grew up learning there were 52 states- Puerto Rico was one, can’t remember the other. I was about 7 or 8 years old when we had 52 States. The teachers and principal showed us the flag shortly before summer vacation came. I went to travel school in 1996. We were taught there are 52 states the 50 United States and Puerto Rico and Hawaii. Makes 52. DC has always been considered a state, I guess not counted as one. If it were that would be 53. Personally. 51 is what makes up the us cluster of states. well ! For a reason I had to argue that the battle flag for the south was not a treason loss but a mistake of a past of wrong beliefs . 13 stars for a lot of mistakes or could the 13 be as simple as the colonist whom did not accept the King , Queen RULE ! I believe as a people we should be looking at things of fake news , and show some love for true Americans! Before we lose some more, OR MORE THAN JUST, STARS! UHH? First off we never had 52 states officially. It is literally called “51st state” They at times included promising places/in process of becoming. For example if some they allowed us to sell Hawii to the UK it would not longer be a state. It is honestly basic history. If you think the flag has never been changed over time you are just flat out dumb. Go pickup a history book. I have a distinct memory of 52 states also. Ok so let’s say I merged into this timeline somewhere along the way- then what the heck happened to the me already on this timeline??? I don’t know because one of my teachers say 50 and one of them say 52 I do not know who is right. *there ARE not there is. I never ever thought there were more or less than 50 states. I dont understand weird phenomenon. I have a verifiable example of the Mandela effect. I would swear that there is a passage in the Bible that states ” and the lion will lay with the lamb ” but if you check the bible it says ” the wolf shall lay with the lamb”. Ok you may ask how is this verifiable? The answer is, watch the 1941 classic Sargent York it shows York standing with his girl and a old man sitting on the porch reading the bible and he says aloud ” and the Lion will lay with the lamb ” that he is reading from the Bible. Dispute that. Why in blazes would America ever have two states whose names were spelled differently but pronounced EXACTLY the same way, so that nobody ever knew which one you were talking about when you said it? This is making my brain hurt!!! This was a topic argued in my life. It’s 50 states, you might think it’s 52 because 48 are mainland + 2 apart mainland. Alaska and Hawaii or not mainland. So some of you might be thinking 50+2 for that reason when really it’s 48+2. Tidbit extra here, Texas is actually a republic unto itself and was voted in a state, but it’s actually it’s own republic as written in law. Hawaii was forcefully/illegally voted in as a state. Again, as is written by the letter of the law, it too is not a state as it was not legally brought into the country as a state. And not, Puerto Rico is not a state, doesn’t look likes its far from it though. Are you people nuts? I’m 54 years old. There have been 50 states since I was born in 1964 and that hasn’t changed. Where are you people getting this nonsense? I love a good conspiracy and believe there are a number of them. This isn’t one. 50 states. Been that way since Hawaii “joined” the union. I have a US map with quarter in it. I counted 52 my husband said no 50. So I just want to know. When I went to school many moons ago. I was told 52 cards in a deck there are 52 states in USA. Ok idiots there’s 50 states and there will most likely not be anymore states added.